Discussion in 'Member's "BackYardHerds" Journals' started by Wehner Homestead, Dec 4, 2017. We bought our farm February 2010. Since then, we have added three kiddos (two of which, their first words was "moo.") We started with some Angus cows and a few finds with the best confirmation possible at market price to raise Show cattle. 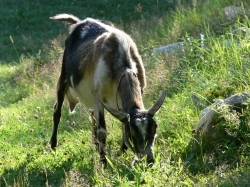 We've also added feeder pigs and we had Boer goats but have switched completely to Nigerian Dwarf Goats to provide milk. Four years ago, we also added chickens of the meat variety. This was quite a learning experience but we now have a varied laying flock that we are looking to make dual purpose. Our chicken story can be found under the same name on BackYard Chickens. We also have 7 dogs and 9 barn cats, along with 2 guinea pigs. I'll add more on each and pictures as time allows. Farmer Connie, Southern by choice, Hens and Roos and 1 other person like this. Recent story: the end of October we had a Nigerian Dwarf goat due. She was to have our first Dwarf kids. I was worried sick about her and I was never like that about our Boers. I actually took a sleeping bag to the barn with her! She went a few days over (I'd have to look at my records to see how many but I think it was a week.) An hour after I saw her having true contractions with no real progression, I sleeved her. There were two front feet presenting but no head. Now some background: our Nigerians were not an impulse buy but I have learned SO much about them since I entered into the agreement to buy this group in May. First off, Sephie wasn't old enough nor big enough to be bred. I didn't lay eyes on her until we picked her up but the breeder offered a free breeding so I assumed that she was big/old enough. Not! Sephie turned one on 12/3. She was bred the end of May and was due to kid almost 2 mos before her first birthday. Not a safe plan! I sleeved her to find that her pelvis was too tight for my hand to enter. I'd read that this shouldn't be the case, as I have a really small hand/arm. I'm the go-to for sleeping. I finally forced my hand in and her pelvis was so small that the bones were grating on mine. I finally got in far enough to feel around and find the head. It was down and to the side. Despite multiple attempts to hook a bale string around the kid's ears as we were unsure if it was still alive or not, we couldn't keep the head up and in position. I felt as though her pelvis just wasn't big enough. I called out vet and she agreed to try pulling the kid. Side note: this all occurred during our daughter's birthday party at the farm. We had more than 50 people here. My sister-in-law and I just loaded Sephie up and left. The vet was unsuccessful in attempting to pull the kid and without knowing if any others were still inside, we opted for a csection at an attempt to at least save her. The whole procedure was very interesting. We found a single, dead buckling (we were pretty sure he had passed by then.) He also wasn't very big for what a single could have been. Sephie also had a uterine rupture that the vet figured happened when she was pushing so hard. The decision was made with her tiny pelvis to spay her. This was an expensive venture and we now have a pet. She's very sweet though. Lesson learned: doelings should be at least a year before breeding and size should always be taken into account. Explaining that the kid died to the kids was bad enough but I couldn't have dealt with explaining that we lost her. There is more to Sephie's adventure but I'll add more later. I have included 3 pics of her (black one) from about 2 weeks before she was due and the day after her csection. Goatgirl47, Remmys mommy, Alexz7272 and 4 others like this. Great start to a journal. sorry for the problems you had with Stephie and hope you have many successes to follow. Please consider putting at least your general location in your profile. I know I've posted to you before,but can't remember where you're located. It can be important when asking for or offering help/advice. Thanks for the pics. following. Farmer Connie and promiseacres like this. Ahh how frustrating for your first kidding!! So glad a vet was available to take care of Sophie. Live On Dreamer and Latestarter like this. Yah, so far Promiseacres seems closest to me in NW Indiana. She's a good gal. I am in Morgan Co, outside of Monrovia. Glad you started a journal. In my opinion, you need meat rabbits. Of course, I tell everyone that. Farmer Connie, Bruce and promiseacres like this. I thought I'd finish Sephie's story before I introduce the rest of the crew. After the stressful birthing and surgical experience, our vet recommended not milking Sephie as we would be unable to use her milk for an extended period of time related to all of the medication withhdrawal times and the potential to make her even more uncomfortable as she wasn't familiar with the milking stand, having her udder touched, and jumping was highly discouraged. We got the bill for a Sunday evening emergency experience about two weeks later and decided to at least try to milk her (as she was also healing very well.) She actually cooperated well but her milk was "thick" but could be pressed out like partially dry glue. We ended up treating her for mastitis that didn't respond to typical interventions and required antibiotic injections while doing intramammary medications. I'm happy to say that she now shows no signs of mastitis but never developed a supply so we are slowly drying her off. The withdrawal from the antibiotics still hasn't passed so our pigs are thoroughly enjoying their share right now. Also, Sephie's breeder had named her "Persephone." I felt that this was bit much for my kids to pronounce so we shortened her name to Sephie. She's now just a pet like a wether since we spayed her when she had her csection. Bruce, Pastor Dave, promiseacres and 1 other person like this. I'm also going to introduce the rest of our herd of Nigees. Sephie, Tinkerbell, Nellie, and King came from the same breeder. Tinkerbell (gold): We often call her Tink. She is quite the stinker. Despite our efforts, she hasn't tamed down. She was also supposed to kid around Nov 12 as she had also been exposed prior to us picking her up. She showed NO signs of a heat until after her due date passed. We did expose her once on 11/17 to King and tomorrow will be 21 days. The more I study her, she seems small and I'm going to let her grow until April and evaluate her again if she didn't take. King (black with white): His name was Elvis. I couldn't take it seriously and since Elvis was the King, we went with that. It fits him better. He is a very sweet buck that enjoys treats and attention. He is penned away from the girls but doesn't seem to mind as long as he can see them. His dam is 2*D. Her udder is very correct as far as teat placement and udder attachment. We look forward to seeing what he can do. Southern by choice and Hens and Roos like this. Our other Does are a group from the same farm also. These Does are Kyeema Ridge bloodlines. Diamond (black with white overlay and waddles): This super sweet girl that loves hugs will be a 2F. Watch for her starts 1/20. Her first kidding was triplet doelings. I would love her to repeat this because I would keep all 3! She was a great producer and has a nice udder. The only downfall I can find to this goat is small scurs. We don't plan on showing until our kids are older so I'm content for her to have a producing purpose. Caramel (gold and white) and Snowflake (light cream): These two Does are full sisters, just from different litters. Caramel kidded twin bucklings in April that were sold as wethers. She is still in milk. Her transition to our farm has been rocky but we are finally getting her settled. Her production has dropped off some with all of the stress so we plan to breed her again April to the buck that we are buying. Caramel is a little standoffish right now but in my space at other times. I think she was very bonded to her previous owner and trying to accept me. Snowflake will be a FF. She was exposed prior to us picking her up and is not guaranteed bred but we haven't seen signs. I may see about drawing blood to pregnancy test her. She looks bred to me but I've been fooled before and I haven't even had Nigees 6 months! IF she's bred, her kid watch starts on March 20. This girl is also VERY sweet and loves the human kids. Bruce, Pastor Dave, Southern by choice and 1 other person like this. My udder wipes were frozen solid when I went to milk this morning! 22 deg when I took DD to the end of the drive to get on the bus. Not sure what the windchill is because it's frigid! Chores in shifts this morning so I can stay warmer and check on the younger two human kids frequently since chores are going to take extended time. Pastor Dave and Latestarter like this.